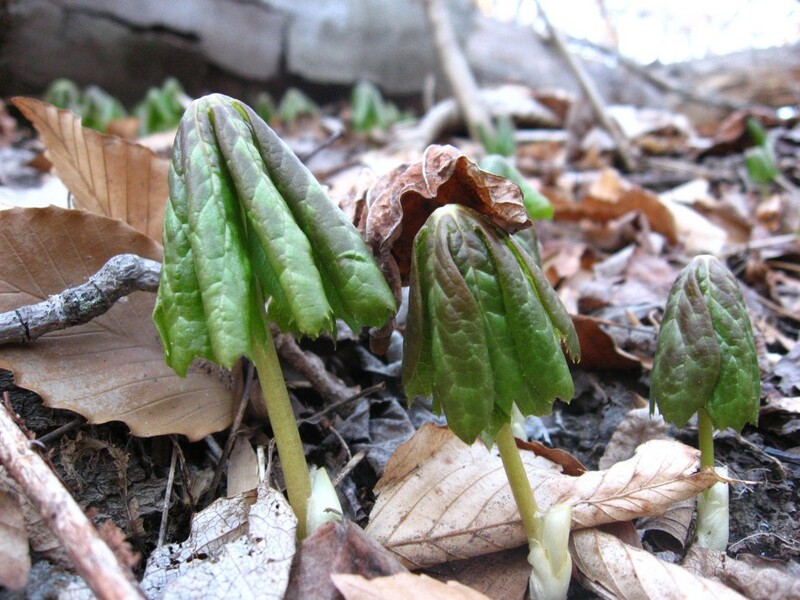 We returned the next day to the section of West Fairmount Park that was at least a week ahead of Morris Park in the Mayapple department. The sun was out and was casting a favorable glow on the Mayapples. (Podophyllum peltatum) We are enchanted by the youthful and jaunty Mayapples rising out of the leaf litter. We found Spring beauty blooming as well. Only three miles away and about 100 feet lower in elevation at the most, and these flowers are blooming. Not to be found even emerging in Morris Park, in the vicinity of Morris Park Road. This native wildflower is so interesting to watch develop. Each specimen has a series of flowers waiting in line along the stem, and every day a new one gets its chance to bloom. We love to find them along the path in Morris Park, or for that matter, wherever we may be. The flowers have very distinct and ultra-thin pinkish stripes in their white blooms. Their stature is small, only about 4 inches. 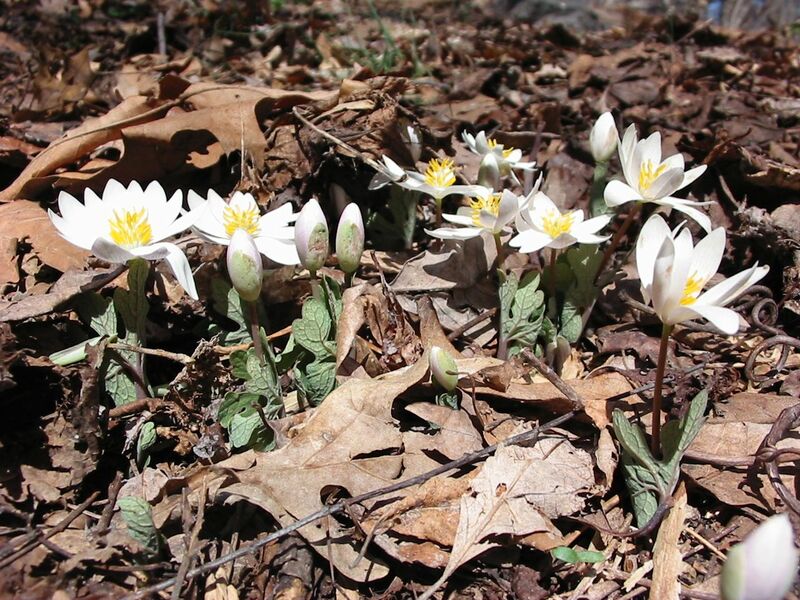 Like Bloodroot and Rue anemone, they must be appreciated from the ground level. Once down on the forest floor, you can see how they grow out of the dense leaf litter, their tiny stems finding the holes in the matte of dead leaves and sending out a pair of long and thin leaves, and then the flower stalk finds its way out, reaches above the leaves and sends out the series of flowers. Like Bloodroot and Rue anenome, these flowers will smile for the camera. 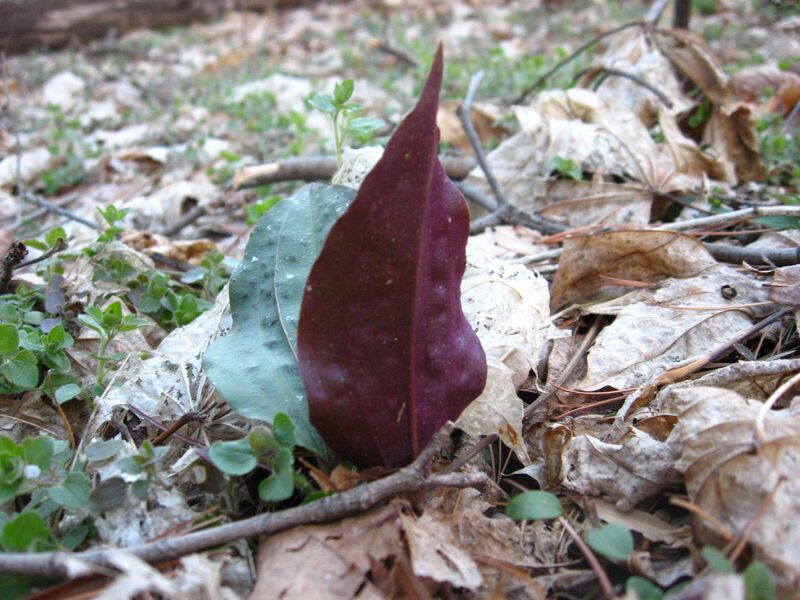 The Sanguine Root likes to move slowly on wooded paths in the spring. 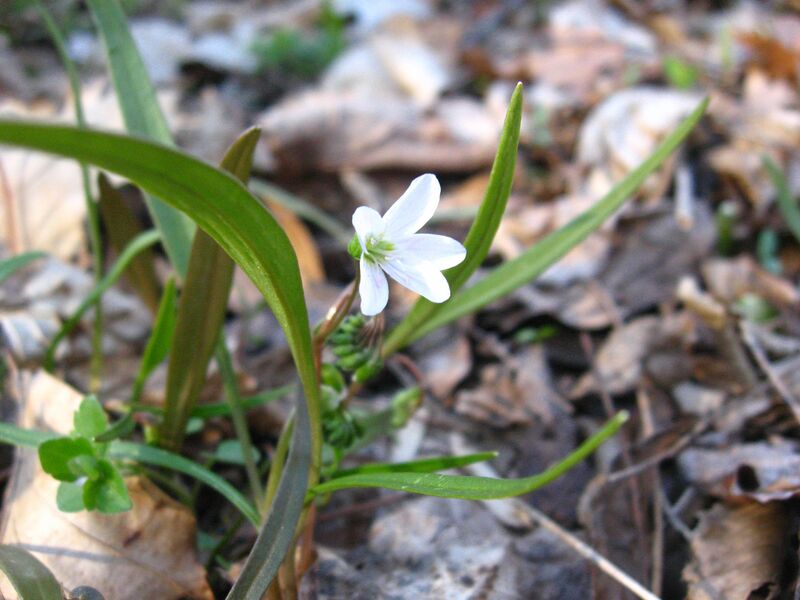 Our cameras have bumped against the forest floor many times getting a picture of the happy life of a small spring flower blooming in its place in the world, in its own ecosystem, often amidst a miniature colony of flowers in the wild. We returned to the site of the Cranefly orchid. The small colony of 5 or so specimens captured our imaginations. 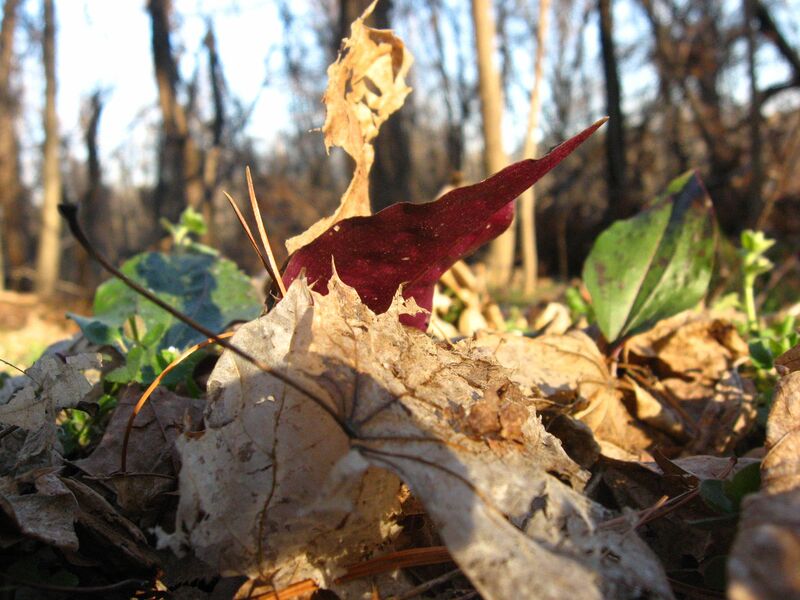 Especially interesting is the underside of the solitary winter leaf. The underside has a rich maroon color. The Maroon color is found only in the veins and some spots on the upper side of the leaf. 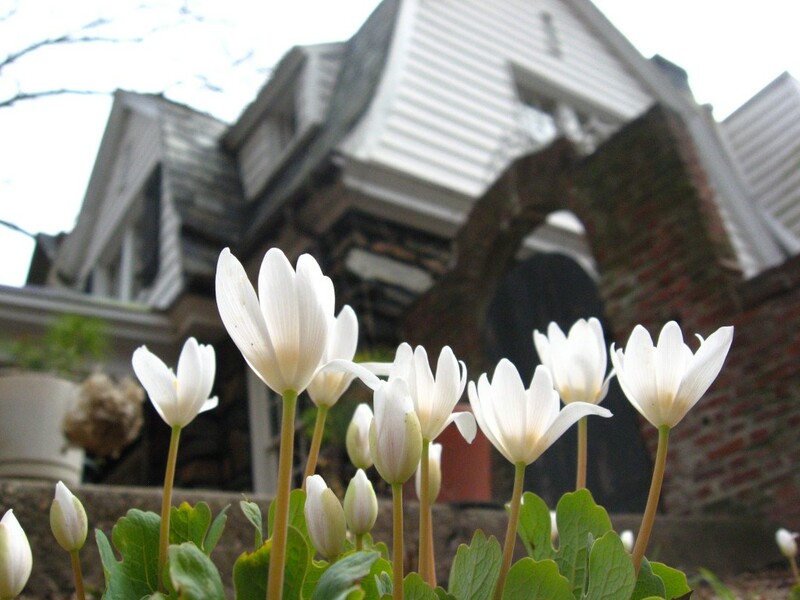 Blooming in the very late morning, the Bloodroot of Morris Park. We have been learning to read a forest landscape by just looking at the fallen leaves. Even last years crop is still legible, old crumpled-up Tulip Poplar and Oak can be seen. 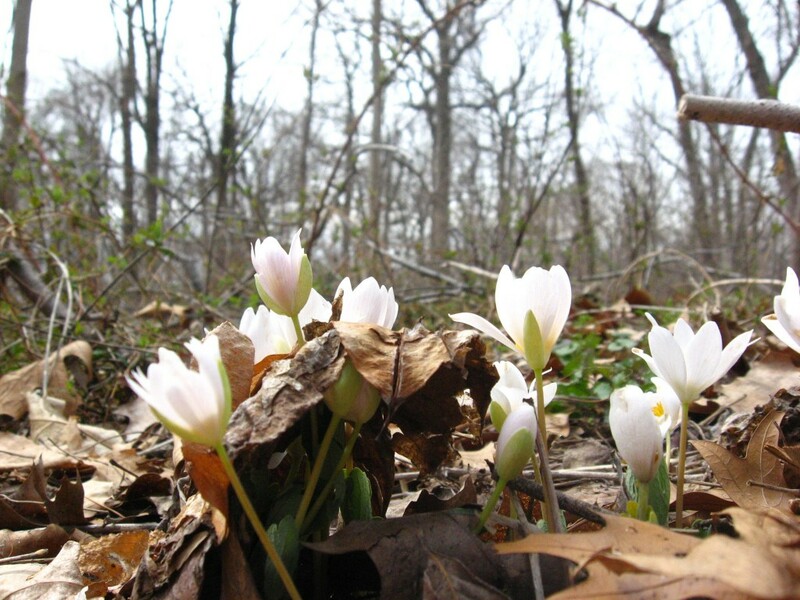 These bloodroot flowers are just now opening up. We have noticed how the cold and rainy weather has not been conducive to full-on blooming. The flowers will remain in a hesitant state for days before they fully open. We were not able to watch, but these flowers most likely fully opened by two this afternoon. This shot was taken around half past eleven. To have the opportunity to observe these flowers on a full-time basis would be necessary to fully understand their nature. However, we have been observing them closely since 2007, and have been able to see patterns of behavior in the past 4 years. Taking interest in this species has helped us understand other native perennials as well. 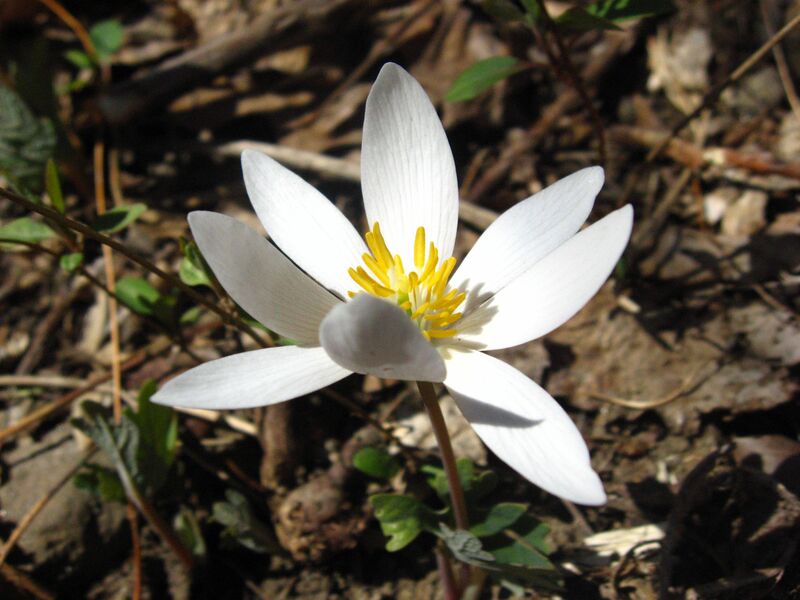 Just a few weeks ago, The Sanguine Root was able to see Bloodroot in the state of Florida, that had already begun seed production. This was eye-opening. We drove over 1000 miles and there it was, Sanguinaria canadensis, growing in Florida. Then, we found it blooming in South Carolina a few days later. Understanding a species will most likely take a lifetime, but most likely more, because species must adapt to constantly changing conditions. When the Sanguine Root Environmental Restoration Team found these two patches, they were just a few flowers barely reaching out of a matte of Japanese honeysuckle, Garlic mustard, and Multiflora rose. These three noxious invasive exotics had taken over this section of woods. Since their control has begun, The native Bloodroot has thrived and expanded its colonies. 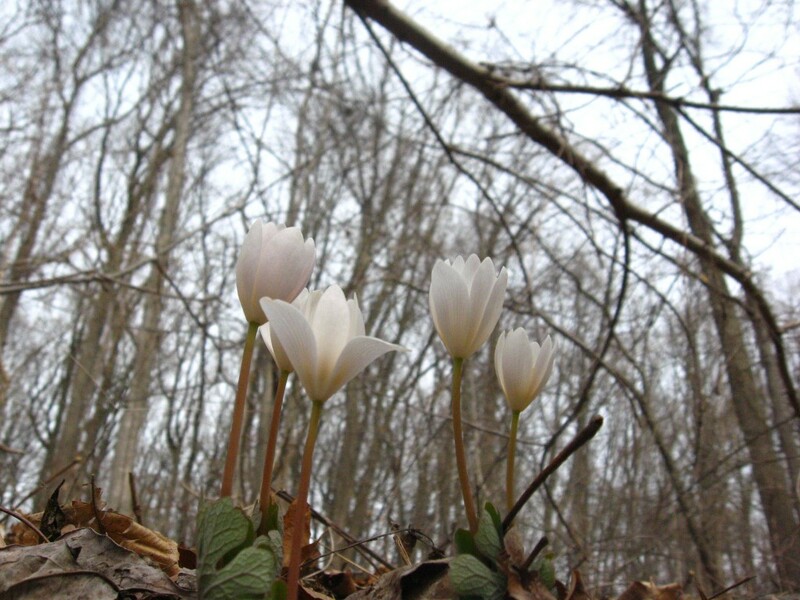 In the picture above can be seen two colonies of Bloodroot, growing successfully on the forest floor. This flower is contributing to the ecosystem by providing an early source of nectar to pollinating insects. The bee we found yesterday just waiting on the outside of the flower, possibly for hours, is illustrative of this need for nectar. 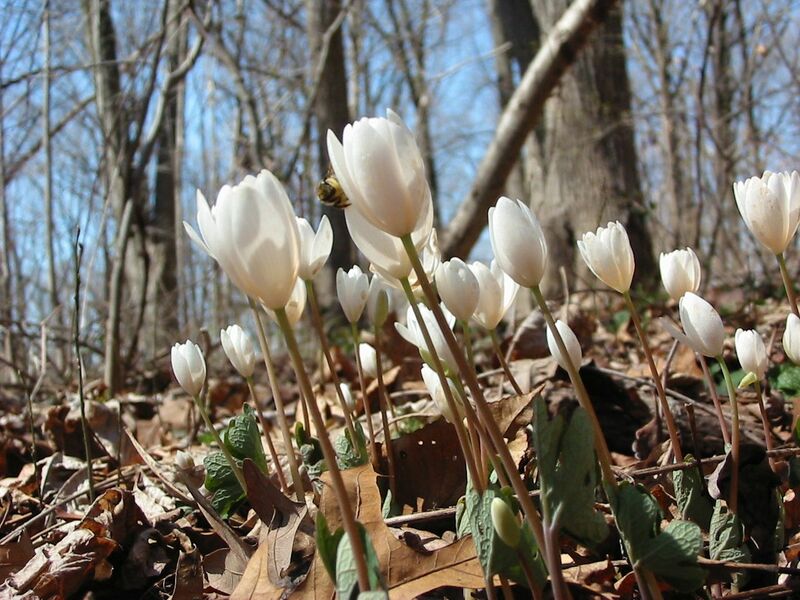 We have seen bloodroot flowers on a warm spring day a-buzz with insects, with so much activity, that some of the petals get knocked off, and fall on to the forest floor, and the bees keep coming anyway. 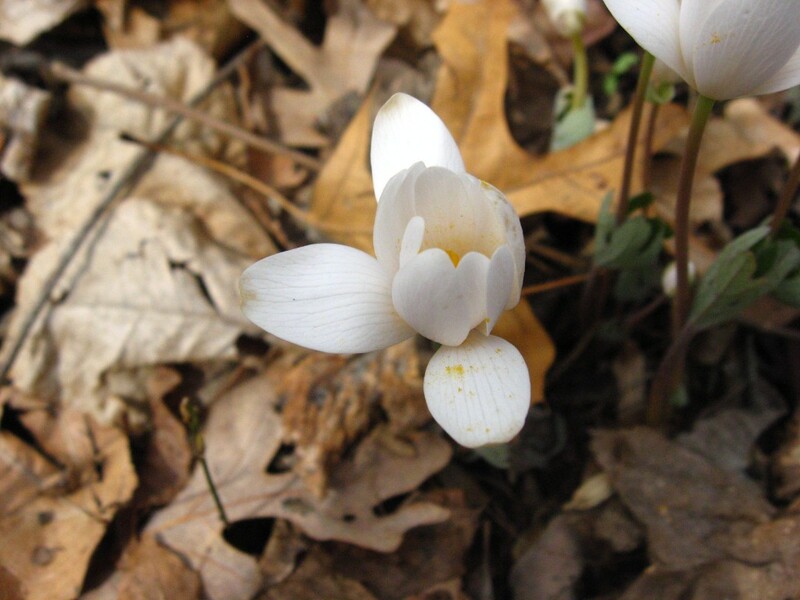 While Bloodroot will pollinate itself, it is the cross-pollination between populations that makes for a healthy species. Genetic diversity is necessary for the longevity of a species. Each strain has its own story to tell, its own adverse series of events, and the plants that survived those events and were able to succeed and grow, and provide pollen, are contributors to the collective genetic pool of a species. The pollen will make its way to a flower of another population, and will find its way into the ovary of the female part of that flower. This flower will now create a seed that has genetic traits that are representative of the specimens within that population that were able to provide pollen during a period of adversity or just a period where a pollen-creating population survived and produced pollen. 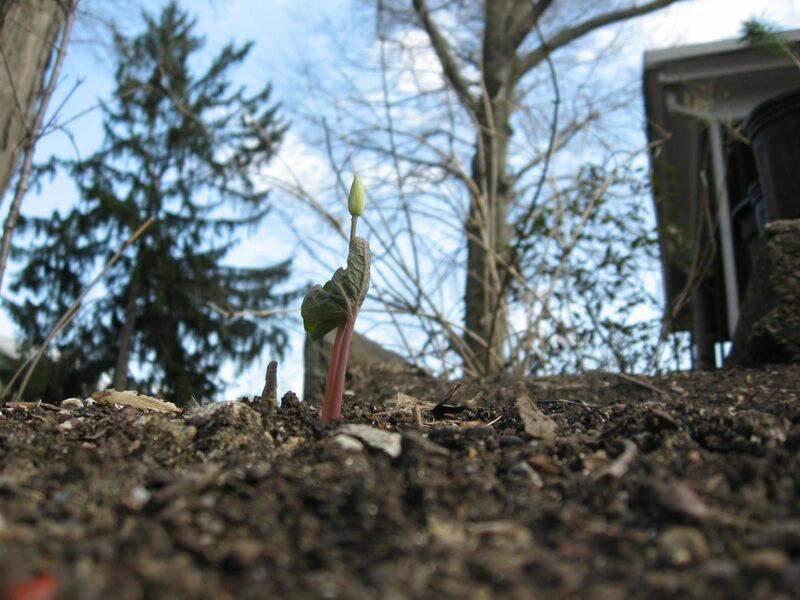 The period of adversity could be just as much as that annoying late March snowstorm or that hailstorm that broke so many of the bloodroot flowers . The flower that was closed up real tight during these events and the three days of cold and rain that followed, but was able to open up the following week for two consecutive days of sunny weather in early April is the one that survives. This is the flower that the insects gravitate towards, and this is the specimen that gets pollen from another survivor a bit away, and now the flower has been exposed to pollen from another flower that has survived the latest early spring hailstorm/snowstorm/cold spell/rain event/heat wave/…This is how any species survives the long haul. The garden of the House of The Sanguine Root. Our gardening philosophy is simple; What native plants are growing in the nearest woods? What Native plants grow in the immediate area of our house historically? These plants will be the most productive from a flowering perspective, because they have been here for thousands of years. A native flowering plant, obtained from a nursery that sells native plants, in your yard, can very possibly be the solution to any anxieties you will ever have about gardening or yard maintenance. Our yard was a dead zone of the non-native Pachysandra (Pachysandra terminalis). We decided to have a yard full of native plants just like the ones in Morris Park, which bordered our house. So one Saturday, we ripped out all of the Pachysandra terminalis. It took us about 18 months to replace it. But the learning process was fun, more of an adventure in cultivation, with some losses along the way. The patch in the picture above started out as one flower, shown in a previous picture. Now, Just four years later, we have our dream yard. The native plant yard is now a contributing part of the local ecosystem, and we have given it a landscaped touch which allows it co-exist with the aesthetics of the neighboring front yards. The patient pollinator: A bee waits for the flower to open. These pictures were taken at lunchtime. With the cool weather, the flowers have been opening only in the afternoons. 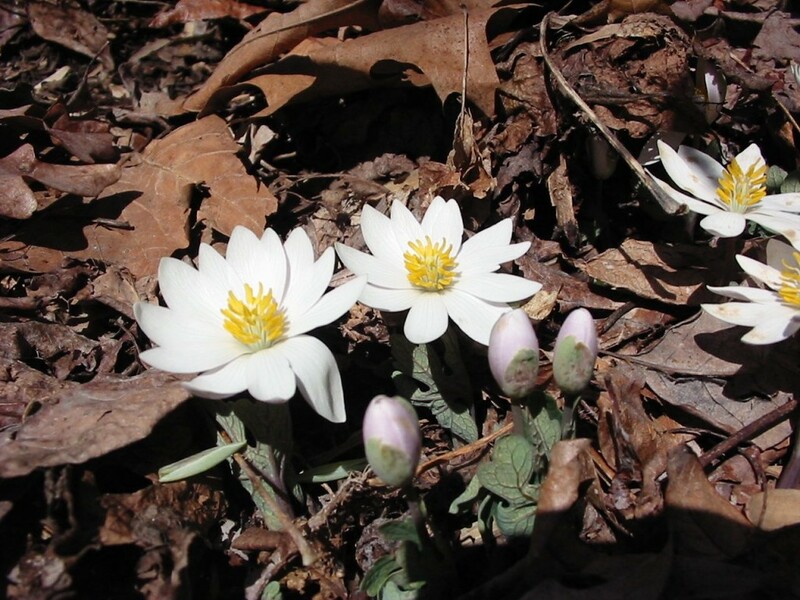 This specific patch of Bloodroot consistently staggers its blooming flowers over a two week period. Since the Sanguine Root Environmental Restoration Team has removed the thick matte of the invasive exotic Lonicera japonica (Japanese honeysuckle), this patch has tripled in size. In the spring of 2007, this patch was only a few flowers. It was a cold morning, but the sun was out. 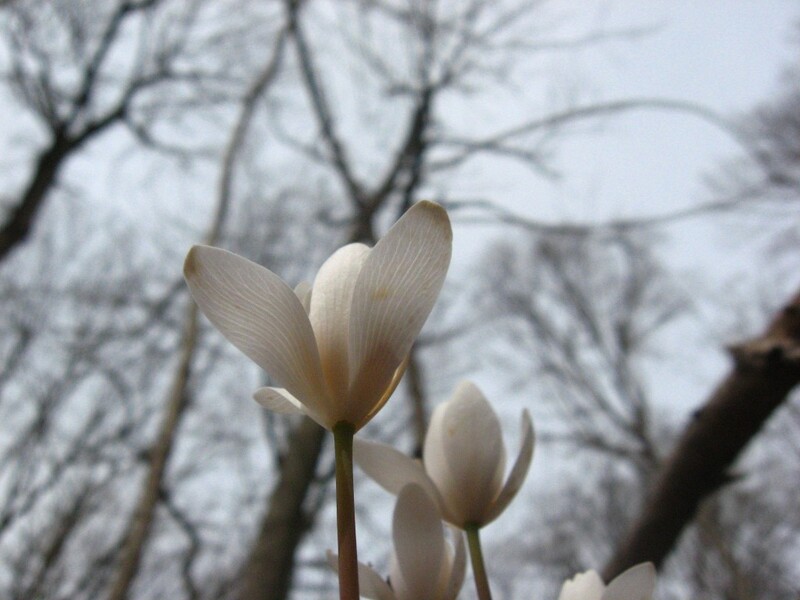 At ten the Bloodroot was still tightly closed up. After lunch, the flowers were opening in a festive manner. They really like the sun. Their overall location is dependent on dappled shade after the trees leaf out. The leaves cannot survive in the full sun. 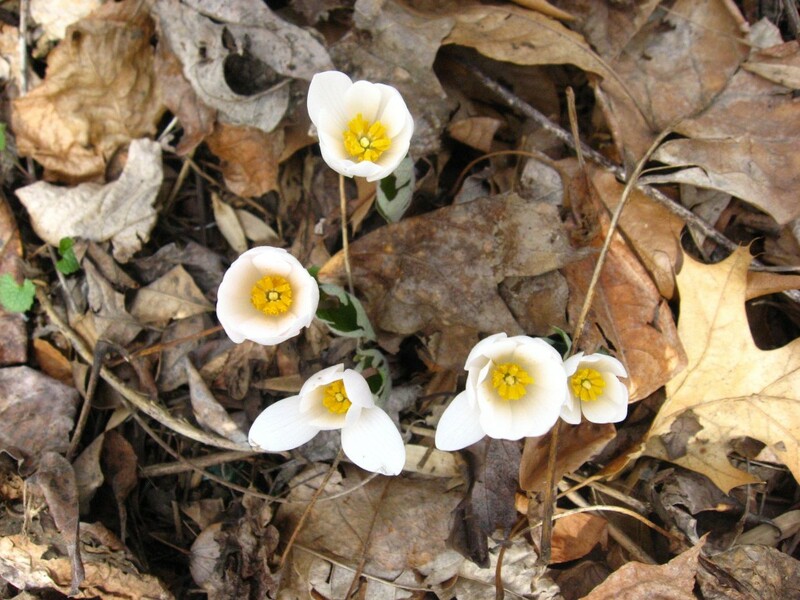 This is truly a forest flower, blooming in the sun of the early spring, before the trees leaf out, but photosynthesizing in the late spring and summer, even through the fall, in the dappled shade of oaks and hickories. This patch is on the other side of the path. Bloodroot is a highly variable species, and the deeply incised leaves of the specimens of this patch are much different than the leaves of other patches in the immediate area. The other patches have more rounded lobes on their leaves. BLOODROOT BLOOMING IN MORRIS PARK, MAYAPPLES RISING OUT THE EARTH IN WEST FAIRMOUNT PARK. 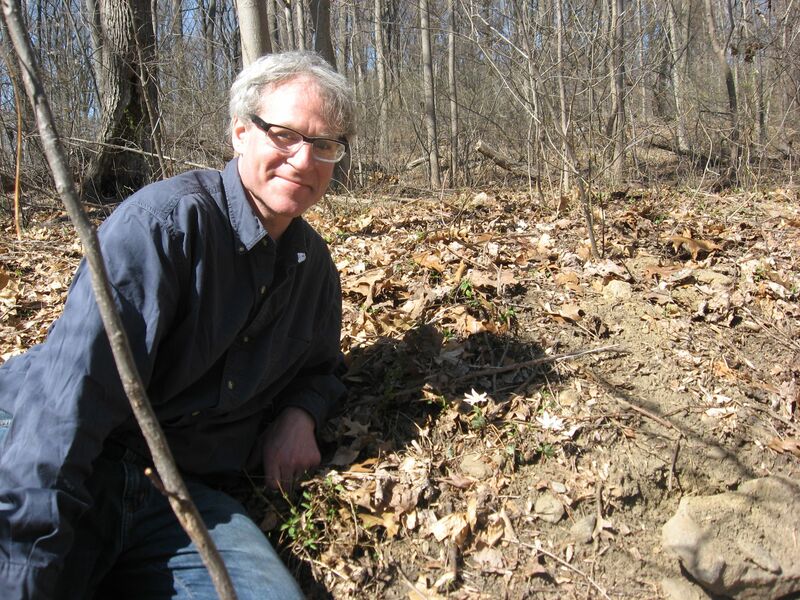 SANGUINE ROOT SPENDS DAY ENJOYING FLOWERS, REMOVING INVASIVES AND EXPLORING NEW AREAS OF FAIRMOUNT PARK. What are those little green umbrellas? 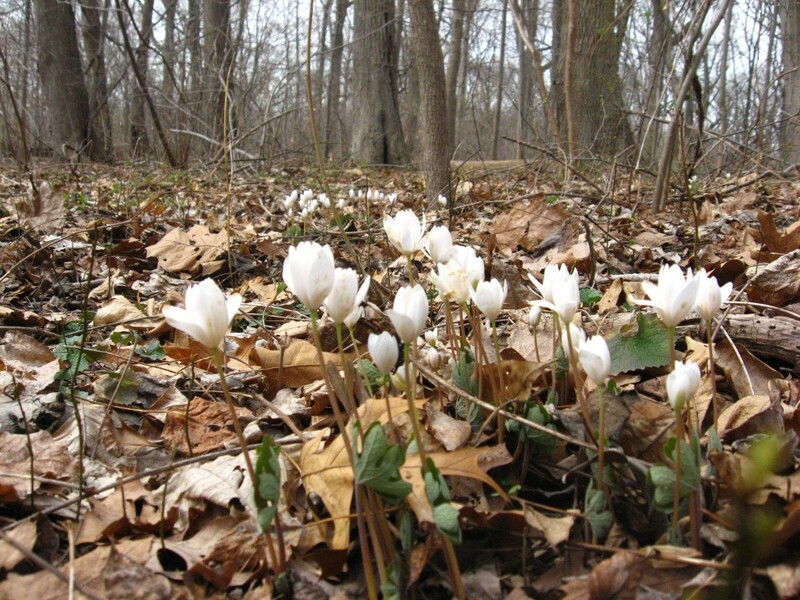 Bloodroot (Sanguinaria canadensis) patch just beginning its bloom season. These guys waited with tightly closed flowers for the past few days during the cold spell. This afternoon’s warm sun encouraged a few of them to let loose and do some blooming while the other wallflowers remained tightly closed. The afternoon between 2 and 4 is the best time to catch a bloom, as long as the sun is out and the temperatures are above 45 degrees. 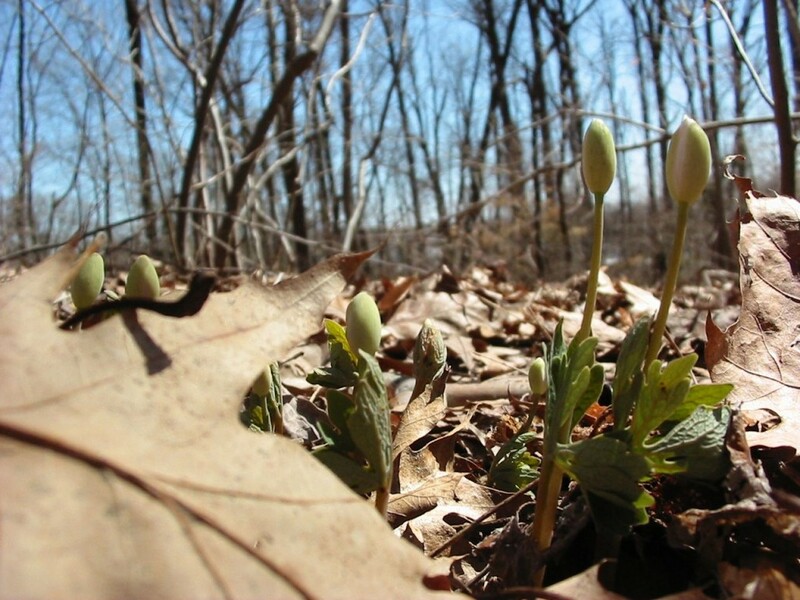 These days, Bloodroot is not a morning riser. There are some populations of Bloodroot that have not even come up yet. The staggering of blooming is a great thing here in Morris Park. The bloom season lasts almost three weeks! 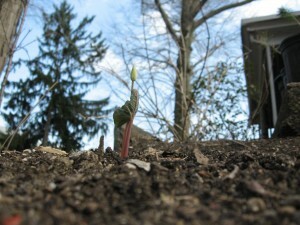 We will keep you posted on the bloom times and the final bloomers and stragglers. Spicebush (Lindera benzoin) in full bloom here in Morris park. This specimen is on a steep hillside that gets lots of sun, and is blooming earlier than other specimens. 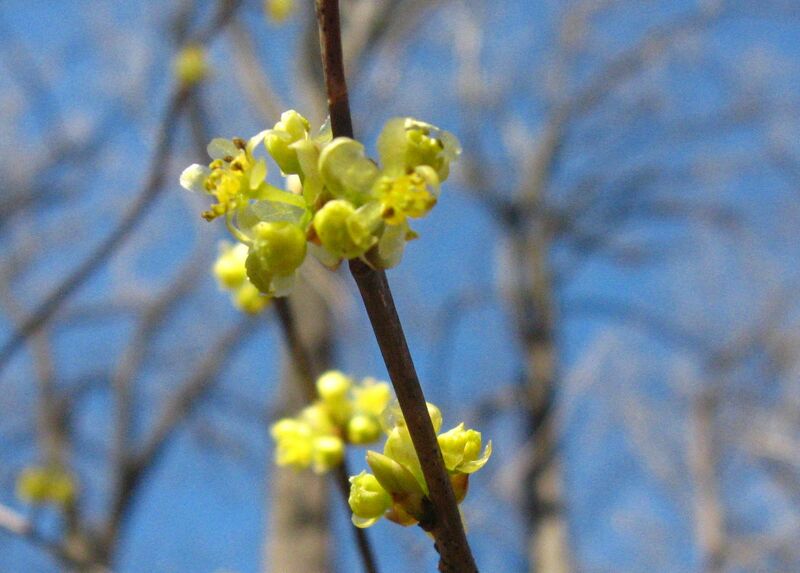 We are starting to see the pretty yellow haze of a forest full of blooming Spicebush. This Bloodroot flower was right underneath the above photographed blooming Spicebush. A happy day. Taking a break from a couple of hours of removing the invasive exotic Euonymus alatus, the Burning bush, a problematic shrub that crowds out native species and creates a negative impact on the forest. 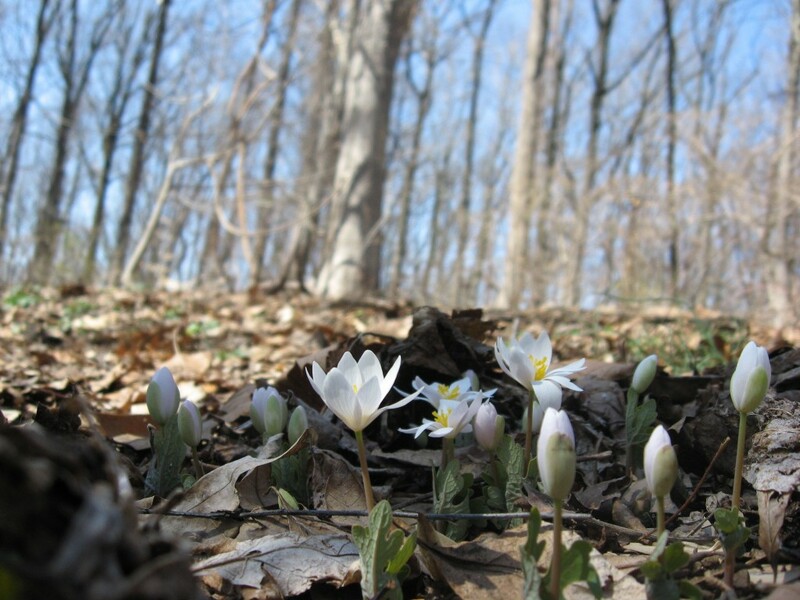 Just a few weeks ago, the Sanguine Root environmental restoration team had removed a thick matte of the invasive exotic Lonicera japonica (Japanese honeysuckle) from the entire area , right where these bloodroot plants are now flowering. Now we can just sit back and enjoy the flowers. We didnt want to to work too hard today and decided to quit early and explore a different section of Fairmount Park. Isabelle wanted to see a happy place, a part of the park without an overwhelming presence of invasives. We both agreed, however, there is no guarantee when we go to a place we have never been to before that we will find such a place. Today, we did find the happy path, a bicycle route north of the Belmont plateau in West Fairmount Park was the ticket. 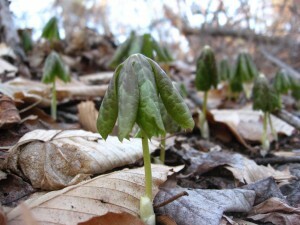 We Found Mayapples (Podophyllum peltatum) rising up from below the leaf litter, a happy forest of little green umbrellas. We were interested that we were only about 100 feet or so lower in elevation than our area of Morris Park, where there are no Mayapples to be seen, and here there they are, coming right up, in West Fairmount Park. It is so interesting to witness different micro-climates within the City Of Philadelphia. 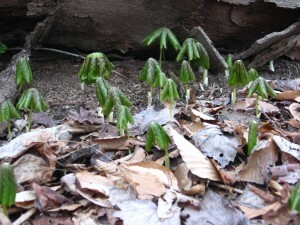 We expect that within the next week, the Mayapples in Morris Park will begin to emerge as well. 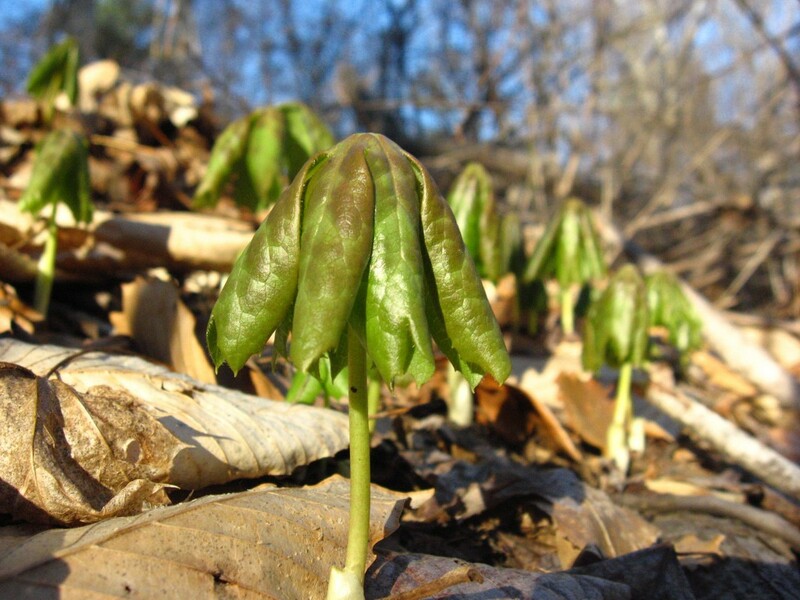 What can be more heart-warming than the emergence of a fresh colony of Mayapples on the hillside in the springtime? We found a very small and isolated colony of the rare Crane-fly orchid (Tipularia discolor) on our walk. What a pleasant surprise. We will have to come back when it blooms.